The Alabama Republican Party is the state affiliate of the national Republican Party in Alabama. It is the dominant (or majority) political party in Alabama. The state party is governed by the Alabama Republican Executive Committee. The ALGOP has more than 400 members which makes it one of the largest state parties in the nation. They are elected in the Republican Primary once every four years with the last election cycle being in 2014. The Alabama Republican Executive Committee is responsible for electing the State Chairman and all other officers who run the day-to-day operations of the party. The Committee elects the National Committeeman and National Committeewoman from Alabama to the Republican National Committee. The Committee is responsible for overseeing the election of Republicans, growing the Republican base and sharing the platforms and principles of the Republican Party. Terry Lathan of Mobile County was elected by the Executive Committee as the Chairman of the Alabama Republican Party on February 21, 2015. She was re-elected without opposition on February 25, 2017. The chairman of the ALGOP is also a member of the Republican National Committee. When the Republican Party was first organized in 1854, as an anti-slavery party, it did not compete in southern states like Alabama. In fact, its 1860 nominee, Abraham Lincoln, was not even on the ballot in Alabama. Following The Civil War and Alabama’s readmission to the union in 1868, Alabama was a Republican dominated state for much of the Reconstruction period due to a combination of factors including its support from unionists, poor white farmers, and newly enfranchised black voters. The Republican Party of Alabama was initially organized on June 4–5, 1867, when the party held its first State Convention in Montgomery. In 1868, William Hugh Smith was elected to a single two-year term as the state’s first Republican governor. That same year saw Republican Andrew Applegate elected as the first ever Lieutenant Governor of Alabama under the state’s newly adopted constitution of 1867. That first post Civil War legislature under the new constitution was elected in February, 1868, with a 100 member House of Representatives (two year terms) composed of 97 Republicans and three Democrats. The State Senate (four year terms) was even more lopsided with a single Democrat to its 32 Republicans. The 1868 legislature also included 27 African-American Republicans, the first minority members in Alabama history. All but one were members of the House of Representatives. That same year Benjamin F. Royal became the first black State Senator in Alabama history. Governor Smith was defeated for re-election in 1870, garnering 49.5% of the vote and losing by a margin of just 1,439 votes. Although the Senate was not up for re-election that year, Democrats retook the House with 57 seats to the Republicans 38 seats of which 19 were African-American Republicans. After Republicans spent a single term out of the Governor’s office, David P. Lewis was elected as the state’s second GOP governor, winning 89,020 to 78,524 over his Democrat opponent. He served from 1872 to 1874. His GOP Lieutenant Governor was Alexander McKinstry. During Governor Lewis’ term, disputed election results produced two competing legislatures, one with a Democrat majority and the other a Republican majority. After this dispute was ultimately settled, Republicans had a 2 seat majority in the House and Democrats a 1 seat majority in the Senate. Again, this 1872 legislature included 24 African-American Republican members with 5 being in the Senate. The 1874 legislature would see only 13 Republican Senators and House membership at 40. However, this legislature would hit a high water mark for minority representation with 33 African-American Republicans. The 1876 election would result in 18 members (7 of which were African-American) being elected to the House and only 4 Republicans to the Senate. Republicans would be reduced to just eight members in the House in the 1878 election. Following the 1880 election Republicans held only a single seat in the Alabama House with the election of Benjamin M. Long from Walker County. In fact, Walker County had a strong Republican Party for much of the remainder of the 19th century. Republican representation in the legislature and other public offices had declined rapidly after the 1875 Constitution was adopted. That document began the process of restricting black voter participation and expanding all forms of Jim Crow laws. Further orchestrated efforts at voter intimidation, lynchings, vote fraud, and the inability of differing Republican factions to work together all doomed the party to long-term failure. After the 1878 election no black, and few Republicans, would be elected to the legislature again until the 1970s. During this same Reconstruction period three African-American Republicans were elected to the United States Congress from Alabama. They were Benjamin Turner (42nd Congress), James T. Rapier (43rd Congress) and Jeremiah Haralson(44th Congress). However, the first Republican Congressmen from Alabama were elected in 1868. They were Charles W. Buckley (40th and 41st Congress’), Francis W. Kellogg, Benjamin W. Norris, Charles W. Pierce, John B. Callis, and Thomas Haughey who would be assassinated in Alabama while giving a speech. The first Republican Senators from Alabama were Willard Warner (1868–1871) and George E. Spencer (1868–1879) who were both elected by the legislature before adoption of the Seventeenth Amendment to the U.S. Constitution. By the late 1890s, a coalition between the Populist Party and the Republican Party often produced “fusion tickets”, that combined forces in several subsequent elections to win control of several of Alabama hill counties in this era. They were most dominant in Marshall, St. Clair, Shelby, and Chilton Counties. Between 1892-1932 Shelby County was usually closely contested under the leadership of A. P. Longshore. Marshall County elected Republican Thomas Kennamer in 1896 to the Alabama House of Representatives. DeKalb County voted in 1896 for GOP Presidential candidate William McKinley. Chilton County was decidedly Republican between 1900–1912, including electing Lewis W. Reynolds as a Republican Probate Judge in 1904 and again in 1916. S. J. Petree was elected as a Republican Probate Judge in Franklin County in 1910; C. C. Scheuing was elected Cullman County Sheriff in 1910; J. B. Sloan was elected as a Republican to the State Senate from a district made up of Blount, Cullman, and Winston Counties. In 1910, J. J. Curtis of Winston County became the first Republican Circuit Judge (for Winston & Walker Counties) in Alabama since Reconstruction. In this time period, in the 54th United States Congress, two brothers, Truman H. Aldrich (1896–1897) and William F. Aldrich (1896–1897), both served as Republicans. William Aldrich also served in the 55th Congress (1898–99) and the 56th Congress (1900–01) with the unusual distinction of having been seated all three times in disputed elections ultimately decided by Congress itself. After William Aldrich left Congress in 1901, no Republican would be elected again until 1964. Following the end of the populist era, Republicans effectively competed in even fewer isolated hill counties, mostly in north Alabama. While the Reconstruction period saw their strongest voting base in the black belt counties, Republicans also relied on many north Alabama counties that had never been strong proponents of the instutition of slavery. They garnered support from a coalition of small farmers, blacks, labor, prohibitionists, labor, etc. Again, these were often voters primarily from counties across the northern width of the state like Lawrence, Blount, Cullman, Walker, Winston, and DeKalb counties. Many of these counties elected Republicans to local office or occasionally to the state legislature even as late as the 1920s. However, only Winston County reliably elected Republicans to almost all offices as the county had attempted to succeed from Alabama during the Civil War and has always been considered ancestrally Republican. During this period the Republican Party relied heavily on federal patronage with federal appointments during Republican administration in Washington for such offices as local Postmasters. The modern Republican Party in Alabama traces its roots back to the election of John Grenier as State Party Chairman in 1962. He played a leading role in re-organizing the party and moving beyond the “Post Office Republican era”. His recruitment of serious candidates for Congress in 1964 would help Republicans sweep five of Alabama’s eight congressional seats with victories by Jack Edwards, Glenn Andrews, James D. Martin, John Buchanan and Bill Dickinson. Martin would give up his congressional seat two years later in an unsuccessful run for Governor against Lurleen Wallace, but the GOP would hold three of the congressional seats for decades to come. That election, commonly referred to in Alabama as “The Goldwater Landslide” would see the GOP win several dozen local offices. It also included the election of Probate Judges in Cullman County named Guy Hunt and Perry O. Hooper, Sr., in Montgomery County. Both would later go on to greater electoral successes. The 1964 election is credited as partially laying the foundations for Alabama’s modern Republican Party. Among the party’s other prominent officeholders in the period were George G. Siebels, Jr. who served two terms as Mayor of Birmingham from 1967–1975, and Emory Folmar who served for many years as Mayor of Montgomery. In 1972, the state party made a historic change from a state convention nominating system for all candidates to having a statewide party primary where voters would directly choose all nominees for public and party offices. This change would only slowly have one of its desired goals to greatly increase support for the GOP. In 1978, the party would begin its long steady build-up to competing for seats in the legislature by winning a few seats in suburban Birmingham, Mobile, and Montgomery. In 1980, Jeremiah Denton became the first popularly elected Republican U. S. Senator in Alabama history. In 1982, Emory Folmar would make the party’s first serious run for Governor since Martin in 1966. Four years later in 1986, Guy Hunt in a very unusual election would defeat the Democrat with 57% of the vote in the Governor’s race. Hunt’s election is widely viewed as effectively making Alabama a two-party state. In 1994, Perry O. Hooper, Sr. would defeat the incumbent Chief Justice of Alabama as Republicans also won 31 seats in the House. Legislative membership continued to climb and Republicans also began winning various statewide offices. 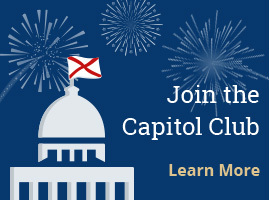 Following the November 2010 election, Republicans won control of the Alabama state legislature for the first time in 136 years winning large majorities in both chambers. Today, Republicans hold both U.S. Senate seats and six of Alabama’s seven seats in the U.S. House of Representatives. No Democrat has been elected to the U. S. Senate from the state since 1992 when Richard Shelby was elected to a second term. Shelby switched parties in 1994 and has since been re-elected easily. The Alabama Republican Party has also greatly helped GOP presidential candidates in the state. All Republican presidential nominees have won Alabama in eight straight elections; the last Democrats to carry Alabama were Jimmy Carter in 1976 and John F. Kennedy in 1960. Republican John McCain won Alabama in 2008 with 60.32% of the total statewide vote over Democrat Barack Obama who received just 38.74%, a 21.58-percent margin of victory for the senior U.S. Senator from Arizona. In 2016, Republican Donald Trump won Alabama with 62.1% of the total statewide vote over Democrat Hillary Clinton who received just 34.4% of the total statewide vote. Winston County, Alabama had the highest percentage of the Trump/Pence vote in the nation. Republicans have also won six of the last seven goverors races in Alabama dating back to 1986. The GOP has also won five consecutive races for Attorney General dating back to 1994. Six of the eight seats on the State Board of Education have elected Republicans. The Alabama Supreme Court and appeallate courts are elected statewide and dominated by Republicans. The nine Supreme Court justices are all Republicans. The states appellate courts also have all 10 seats occupied by Republicans. The Yellowhammer State can accurately be described as one of the more staunchly Republican states in the nation.